There has been a lot of discussion on-line recently about languages for data analysis, statistical computing, and data science more generally. I don’t really want to go into the detail of why I believe that all of the common choices are fundamentally and unfixably flawed – language wars are so unseemly. Instead I want to explain why I’ve been using the Scala programming language recently and why, despite being far from perfect, I personally consider it to be a good language to form a platform for efficient and scalable statistical computing. Obviously, language choice is to some extent a personal preference, implicitly taking into account subjective trade-offs between features different individuals consider to be important. So I’ll start by listing some language/library/ecosystem features that I think are important, and then explain why. The above are points (and there are other similar points) where other languages (for example, R), currently score better than Scala. It is not that these things are not important – indeed, they are highly desirable. But I consider them to be of lesser importance as they are much easier to fix, given a suitable platform, than fixing an unsuitable language and platform. Visualisation is not trivial, but it is not fantastically difficult in a language with excellent GUI libraries. Similarly, most statistical routines are quite straightforward to implement for anyone with reasonable expertise in scientific and statistical computing and numerical linear algebra. These are things that are relatively easy for a community to contribute to. Building a great programming language, on the other hand, is really, really, difficult. I will now expand briefly on each point in turn. In this day-and-age it is vital that statistical code can use a variety of libraries, and communicate with well-designed network libraries and web frameworks, as statistical analysis does not exist in a vacuum. Scala certainly fits the bill here, being used in a large number of important high-profile systems, ensuring a lively, well-motivated ecosystem. There are numerous well-maintained libraries for almost any task. Picking on web frameworks, for example, there are a number of excellent libraries, including Lift and Play. Scala also has the advantage of offering seamless Java integration, for those (increasingly rare) occasions when a native Scala library for the task at hand doesn’t exist. This hardly needs expanding upon, other than to observe that there are a few well-known commercial software solutions for scientific, statistical and mathematical computing. There are all kinds of problems with using closed proprietary systems, including transparency and reproducibility, but also platform and scalability problems. eg. running code requiring a license server in the cloud. The academic statistical community has largely moved away from commercial software, and I don’t think there is any going back. Scala is open source and runs on the JVM, which is about as platform independent as it is possible to get. Speed and efficiency continue to be important, despite increasing processor speeds. Computationally intensive algorithms are being pushed to ever larger and more complex models and data sets. Compute cycles and memory efficiency really matter, and can’t be ignored. This doesn’t mean that we all have to code in C/C++/Fortran, but we can’t afford to code in languages which are orders of magnitude slower. This will always be a problem. Scala code generally runs well within a factor of 2 of comparable native code – see my Gibbs sampler post for a simple example including timings. I hesitated about including this in my list of essentials, because it is certainly something that can, in principle, be added to a language at a later date. However, building such libraries is far from trivial, and they need to be well-designed, comprehensive and efficient. For Scala, Breeze is rapidly becoming the standard scientific library, including special functions, non-uniform random number generation and numerical linear algebra. For a data library, there is Saddle, and for a scalable analytics library there is Spark. These libraries certainly don’t cover everything that can be found in R/CRAN, but they provide a fairly solid foundation on which to build. I love dynamic languages – they are fun and exciting. It is fun to quickly throw together a few functions in a scripting language without worrying about declaring the types of anything. And it is exciting to see the myriad of strange and unanticipated ways your code can crash-and-burn at runtime! 😉 But this excitement soon wears off, and you end up adding lots of boilerplate argument checking code that would not only be much cleaner and simpler in a statically typed language, but would be checked at compile-time, making the static code faster and more efficient. For messing about prototyping, dynamic languages are attractive, but as a solid platform for statistical computing, they really don’t make sense. Scala has a strong type system offering a high degree of compile-time checking, making it a safe and efficient language. A common issue with statically typed languages is that they lead to verbose code containing many redundant type declarations that the compiler ought to be able to check. This doesn’t just mean more typing – it leads to verbose code that can hide the program logic. Languages with type inference offer the best of both worlds – the safety of static typing without the verbosity. Scala does a satisfactory job here. One thing that dynamic languages have taught us is that it is actually incredibly useful to have a REPL for interactive analysis. This is true generally, but especially so for statistical computing, where human intervention is often desirable. Again, Scala has a nice REPL. Tools matter. Scala has an excellent build tool in the SBT. It has code documentation in the form of scaladoc (similar to javadoc). It has a unit testing framework, and a reasonably intelligent IDE in the form of the Scala IDE (based on Eclipse). I, like many others, am gradually coming to realise that functional programming offers many advantages over other programming styles. In particular, it provides best route to building scalable software, in terms of both program complexity and data size/complexity. Scala has good support for functional programming, including immutable named values, immutable data structures and for-comprehensions. And if off-the-shelf Scala isn’t sufficiently functional already, libraries such as scalaz make it even more so. Although most algorithms in scientific computing are typically conceived of and implemented in an imperative style, I’m increasingly convinced that most can be recast in a pure functional way without significant loss of efficiency, and with significant benefits. That said, there really are some problems that are more efficient to implement in an imperative framework. It is therefore important that the language is not so “pure” functional that this is forbidden. Again, Scala fits the bill. These days scalability typically means exploiting concurrency and parallelism. In an imperative world this is hard, and libraries such as MPI prove that it is difficult to bolt parallelism on top of a language post-hoc. Check-points, communication overhead, deadlocks and race conditions make it very difficult to build codes that scale well to more than a few processors. Concurrency is more straightforward in functional languages, and this is one of the reasons for the recent resurgence of functional languages and programming. Scala has good concurrency support built-in, and libraries such as Akka make it relatively easy to build truly scalable software. The Scala programming language ticks many boxes when it comes to forming a nice solid foundation for building a platform for efficient scalable statistical computing. Although I still use R and Python almost every day, I’m increasingly using Scala for serious algorithm development. In the short term I can interface to my Scala code from R using jvmr, but in the longer term I hope that Scala will become a complete framework for statistics and data science. In a subsequent post I will attempt to give a very brief introduction to Scala and the Breeze numerical library. where, in our case, is the prior and is the posterior. and run a parallel tempering scheme as outlined in the previous post. The idea is that for small values of mixing will be good, as prior-like distributions are usually well-behaved, and the mixing of these "high temperature" chains can help to improve the mixing of the "low temperature" chains that are more like the posterior (note that is really an inverse temperature parameter the way I’ve defined it here…). This quantity is of interest for many reasons, including calculation of the Bayes factor between two competing models. Note that this quantity has several different names in different fields. In particular, it is often known as the evidence, due to its role in Bayes factors. 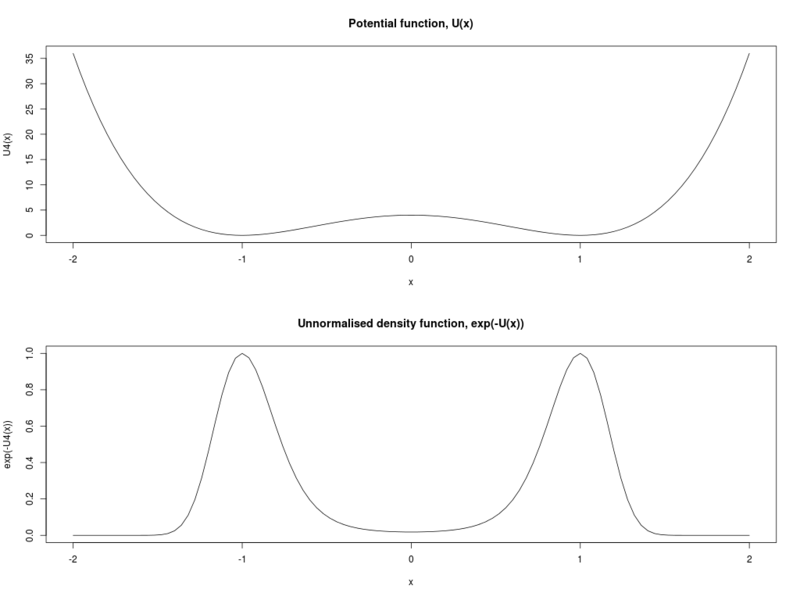 It is also worth noting that it is the normalising constant of the Bayesian posterior distribution. Although it is very easy to describe and define, it is notoriously difficult to compute reliably for complex models. and this will be a consistent estimator of the true evidence under fairly mild regularity conditions. Unfortunately, in practice it is likely to be a very poor estimator if the posterior and prior are not very similar. Now, we could also use Bayes theorem to re-write the integral as an expectation with respect to the posterior, so we could then use samples from the posterior to estimate the evidence. This leads to the harmonic mean estimator of the evidence, which has been described as the worst Monte Carlo method ever! 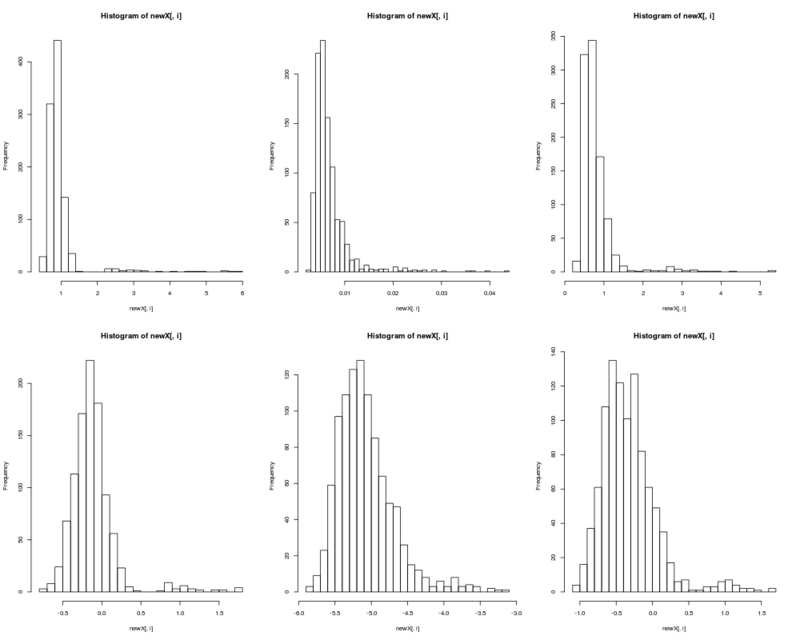 Now it turns out that there are many different ways one can construct estimators of the evidence using samples from the prior and the posterior, some of which are considerably better than the two I’ve outlined. This is the subject of the bridge sampling paper of Meng and Wong. However, the reality is that no method will work well if the prior and posterior are very different. where the expectation is with respect to the th target, and hence can be estimated in the usual way using samples from the th chain. So, an alternative approach to computing the evidence is to use the samples to approximately numerically integrate the above integral, say, using the trapezium rule. However, it isn’t completely clear (to me) that this is better than using directly, since there there is no numerical integration error to worry about. A Monte Carlo estimate of each of these terms is formed using the samples from the th chain, and the logs of these are then summed to give . A complete R script to run the Metropolis coupled sampler and compute the evidence is given below. Meng, Xiao-Li, and Wing Hung Wong. “Simulating ratios of normalizing constants via a simple identity: a theoretical exploration.” Statistica Sinica 6.4 (1996): 831-860. Gelman, Andrew, and Xiao-Li Meng. “Simulating normalizing constants: From importance sampling to bridge sampling to path sampling.” Statistical Science (1998): 163-185. Friel, Nial, and Anthony N. Pettitt. 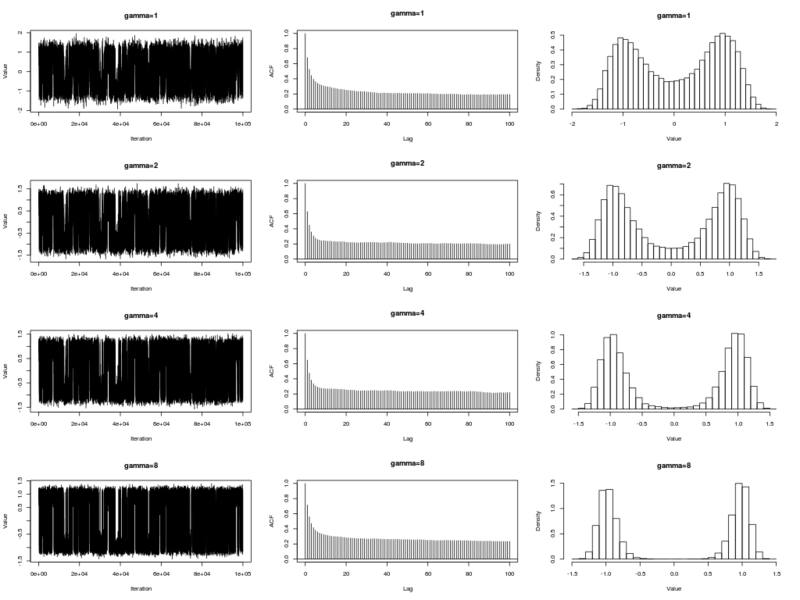 “Marginal likelihood estimation via power posteriors.” Journal of the Royal Statistical Society: Series B (Statistical Methodology) 70.3 (2008): 589-607. Friel, Nial, and Jason Wyse. “Estimating the evidence–a review.” Statistica Neerlandica 66.3 (2012): 288-308. Parallel tempering is a method for getting Metropolis-Hastings based MCMC algorithms to work better on multi-modal distributions. Although the idea has been around for more than 20 years, and works well on many problems, it still isn’t routinely used in applications. I think this is partly because relatively few people understand how it works, and partly due to the perceived difficulty of implementation. I hope to show here that it is both very easy to understand and to implement. It is also rather easy to implement in parallel on multi-core systems, though I won’t get into that in this post. Incidentally, the function curried(), which curries the potential function, did not include the message() statement when I first wrote it. It mostly worked fine, but some of the code below didn’t behave as I expected. I inserted the message() statement to figure out what was going on, and the code started behaving perfectly – a beautiful example of a Heisenbug! The reason is that the message statement is not redundant – it forces evaluation of the gam variable, which is necessary in some cases, due to the lazy evaluation model that R uses for function arguments. If you don’t like the message() statement, replacing it with a simple gam works just as well. Anyway, the point is that we have defined a multi-modal density, and that a Metropolis-Hastings algorithm initialised in one of the modes will have a hard time jumping to the other mode, and the difficulty of this jump will increase as we increase the value of . We can write a simple function for a Metropolis algorithm targeting a particular potential function as follows. We can use this code to run some chains for a few different values of as follows. leading to the plot below. We see that as increases, the chain jumps between modes less frequently. Indeed, for , the chain fails to jump to the second mode at all during this particular run of 100,000 iterations. That’s a problem if we are really interested in sampling from distributions like this. 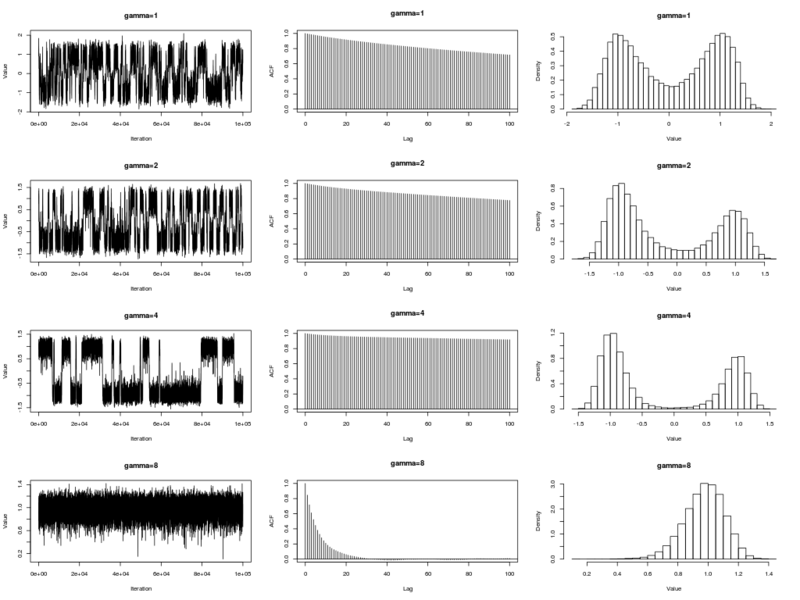 Of course, for this particular problem, there are all kinds of ways to fix this sampler, but the point is to try and develop methods that will work in high-dimensional situations where we cannot just “look” at what is going wrong. Before we see how to couple the chains and improve the mixing, it is useful to think how to re-write this sampler. Above we sampled each chain in turn for different barrier heights. To couple the chains, we need to sample them together, sampling each iteration for all of the chains in turn. This is very easy to do. The code below isn’t especially efficient, but it is written to look very similar to the single chain code above. This code should behave identically to the previous code, simulating independent parallel MCMC chains. However, the code is now in the form that is very easy to modify to couple the chains together in an attempt to improve mixing. In the above example the chains we are simulating are all independent of one another. Some mix reasonably well, and some mix very badly. But the distributions are all related to one another, changing gradually as the barrier height changes. The idea behind coupling the chains is to try and swap states between the chains to use the chains which are mixing well to improve the mixing of the chains which aren’t. In particular, suppose interest is in the target of the worst mixing chain. The other chains can be constructed as “tempered” versions of the target of interest, here by raising it to a power between 0 and 1, with 0 corresponding to a complete flattening of the distribution, and 1 corresponding to the desired target. The use of parallel chains to improve mixing in this way is usually referred to as parallel tempering, but also sometimes as . In the context of Bayesian inference, tempering using the “power posterior” can often be more natural and useful (to be discussed in a subsequent post). This can be used as before, but now gives results as illustrated in the following plots. We see immediately from the plots that whilst the individual target distributions remain unchanged, the mixing of the chains is greatly improved (though still far from perfect). Note that in the code above I just picked two chains at random to propose a state swap. In practice people typically only propose to swap states between chains which are adjacent – i.e. most similar, since proposed swaps between chains with very different targets are unlikely to be accepted. Since implementation of either strategy is very easy, I would recommend trying both to see which works best. It should be clear that there are opportunities for parallelising the above algorithm to make effective use of modern multi-core hardware. An approach using OpenMP with C++ is discussed in this blog post. Also note that if the state space of the chains is large, it can be much more efficient to swap temperatures between the chains rather than states – so long as you are careful about keeping track of stuff – this is explored in detail in Altekar et al (’04). G. Altekar et al (2004) Parallel Metropolis coupled Markov chain Monte Carlo for Bayesian phylogenetic inference, Bioinformatics, 20(3): 407-415. C. J. Geyer (2011) Importance sampling, simulated tempering, and umbrella sampling, in the Handbook of Markov Chain Monte Carlo, S. P. Brooks, et al (eds), Chapman & Hall/CRC. C. J. Geyer (1991) Markov chain Monte Carlo maximum likelihood, Computing Science and Statistics, 23: 156-163. For convenience, a complete R script to run all of the examples in this post is given below.